AntiBot is as subtle, effective and automated as the pesky programs it aims to stop. During normal day-to-day usage it didn't flag up anything legitimate as suspect, and quarantined any malware we threw at it. 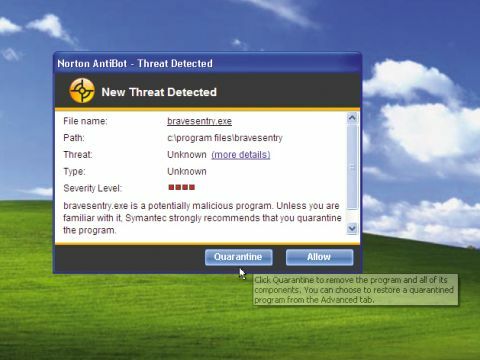 It's easy to grasp, and anyone who uses traditional anti-virus software will be at home instantly. The interface takes the Control Centre format, with simple information and actions displayed clearly in the window, and it works well in conjunction even with other anti-virus (McAfee, in this case), requiring little memory or processing power. Its main drawback is that it struggles to tackle any malware on your system already, even refusing to install in some cases, so you need a security package running if you're planning to use it. Costing £15, it's a smart purchase for any home users, especially those who make frequent transactions online. For businesses, though, forking out for every licence on top of existing security might be too much, and IT managers would do well to await AntiBot's inclusion in a future full package.